In the four months since Conrad Morrisey's beloved wife, Rose, died, he has let her cherished garden slide into neglect, just as he has stopped caring what he eats or wears. But there, in Rose's overgrown and unkempt garden, Conrad receives an unearthly visitor, familiar yet perplexing. What does this mean? What should he do? What would vivacious Rose have done? She would not have kept it a secret, Conrad decides, so he begins to share his story. And suddenly he finds himself at the center of Rose's life in a way he'd never experienced, learning how she touched the lives of people he barely knew. These people, from a silent, damaged young woman to the twittering ladies of Rose's drama group, shape his own days as they make unlikely pilgrimages to the garden. Conrad had thought his life was over, but something vital has yet to happen, on the wings of Rose's last message of love. 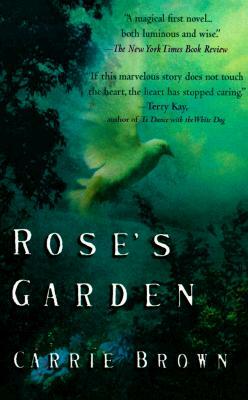 Incandescent, quirky, and poignant, Rose's Garden is an unforgettable story of undying love. Winner of the 1999 Barnes and Noble Discover New Writers Award. "A magical first novel...both luminous and wise." "If this marvelous story does not touch the heart, the heart has stopped caring." "Simply the most romantic love story you will read this year. Don't miss it." "Brown's writing...conveys intense events and emotions with a deceivingly gentle touch." "Carrie Brown's writing is rich, lyrical, heartbreaking, and luminous."